So I made a lasagna for the first time in years and it was delicious! My daughter tried it and said, “Mom, I love it, but what are these things on the bottom.” Knowing zuchinni isn’t her favorite vegetable, when she then said, “are they noodles?”, well, I didn’t totally deny it. I used the zucchini as noodles in this recipe so it wasn’t completely untrue. And thanks to a friend’s advice (in recipe below) they certainly were more noodle-like. But for those who absolutely have to have noodles, there is a gluten/wheat free lasagna noodle called Tinkyada that I found at Publix. It’s made with brown rice, rice bran, water, and that’s it. It got really great reviews on Amazon so it must be decent. 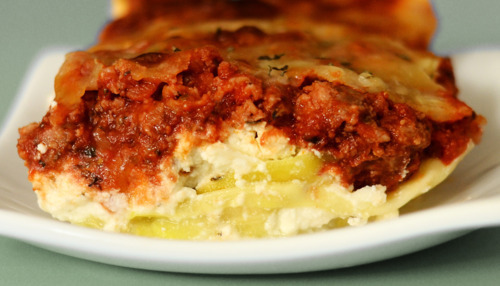 By the way, this picture would look better if I had “layered” the lasagna a couple of times. Instead, I did just 1 layer. I told you had been awhile since I made lasagna!! Brown Italian sausage and ground meat on medium to medium high heat. Drain if needed. To the meat mixture add diced onions and allow to soften for 5 minutes. Add in garlic, stir for 30 seconds. Incorporate tomato sauce, diced tomatoes, salt, and seasonings with meat. Reduce heat and allow to simmer stirring occasionally for about 15 minutes. 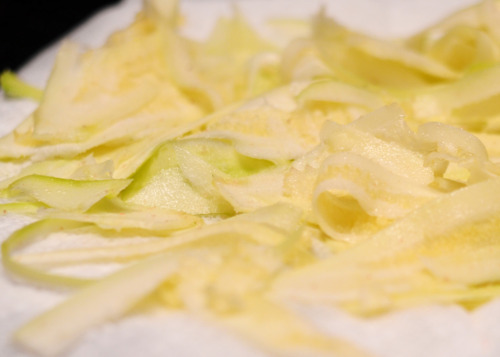 Slice zucchini into thin horizontal sheets similar to lasagna pasta. The recipe called for 1/4 thick slices but I used a hand peeler to make them extra skinny. Then lay them out and pat dry on paper towels. Add a good bit of salt and set aside to dry to make them taste more like noodles (thanks for the advise Shannon!). Check meat sauce for flavoring, adjust if necessary. 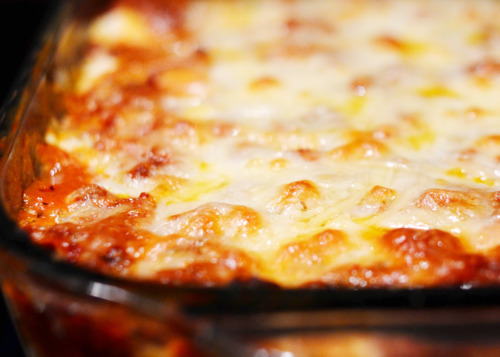 Once the meat sauce liquid has reduced remove from heat and line up all ingredients to assemble the lasagna. Then repeat 1 or 2 more times! Bake for 45 minutes or until bubbly throughout and cheese is dark golden brown. Rest for 10 minutes before slicing and enjoy!